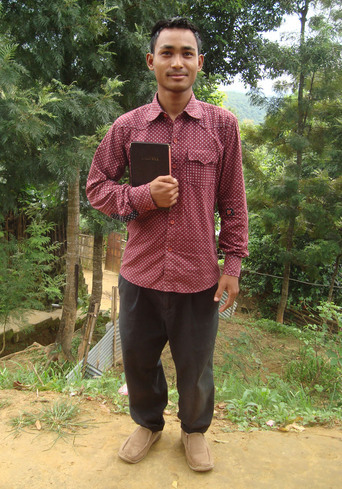 Meet our new friend and Gospel For Asia missionary from India – Bilibond. Being that I just got my annual bonus and raise from my day job, I wanted to “give the first fruits” to God to honor Him for blessing our family. Last night I gave my wife the heads-up that I wanted to sponsor a missionary from GFA. This morning we sponsored Bilibond – a missionary from India. I was born June 15, 1986, into a nominal Christian family in India. During childhood, I attended the Sunday school and involved in the church activities. When I was a small child, I did not get proper education because my father passed away. His death made us to go through much difficulty. In the course of time, I spent time in sinful activities. Due to bad behavior, I lost my job. My mother prayed and counseled me to stay away from worldly activities. One particular day, my mother asked me to go to the church. Accordingly, I went and heard the message about salvation from God’s servant. As he was sharing, God helped me understand the message. Those words touched my heart. Then I realized God’s love and sins I had committed. Being convicted of my sins, I confessed my sins and received Jesus as my Savior. After receiving Jesus, I got new job in order to earn money. I felt joy and peace in my heart and I decided to follow Him. I left my job and started to attend the church activities. I have a burden to propagate the Gospel. As I asked the Lord for His will, He confirmed me of His calling and I enrolled in a GFA Bible School. I’m not sharing this with you readers because I want to brag about what we’re doing. Instead, I want to challenge you to consider sponsoring a missionary from GFA.